Note: The information on this page pertains to the 2018 garden testing program. Please check back early in the 2019 dahlia season to see the plans for 2019. With the cooperation of Professor Pappu at Washington State University and the support of the Scheetz-Chuey Foundation, the Clean Dahlia Center at WSU will test our dahlias for virus again this year. The spirit of the testing project follows from two key observations. First, dahlias that are tested and found to be free of virus produce tubers and plants in the subsequent year that have a significantly lower incidence of virus than untested plants. Second, and probably more importantly, dahlias that test positive for virus produce tubers and plants in the subsequent year that virtually always have virus! 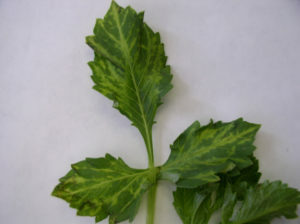 It is critical that we weed out plants that have virus. Two key programs are planned for this season. A large number of test slots have been reserved for dahlia vendors who choose to take advantage of a free and confidential testing program. Details of the program are in the June ADS Bulletin. Registration for the program is due by June 30, however, depending on the response, additional applications may be accepted into early July. So if you are interested, please apply! If you applied for the program and received confirmation of your participation, please follow the instructions below for submitting your samples. The program of open testing of sets of 30 or more samples for $10 per sample is available again. This approach has been used by our ADS member clubs to evaluate candidate plants for sale at auctions in the subsequent year. Please follow the instructions available below for submitting your samples. We anticipate that the turnaround time for the tests will be better this year than last. Nevertheless, you should plan on waiting several weeks to get results. Please read the complete instructions for submitting your samples.